Huzzah! 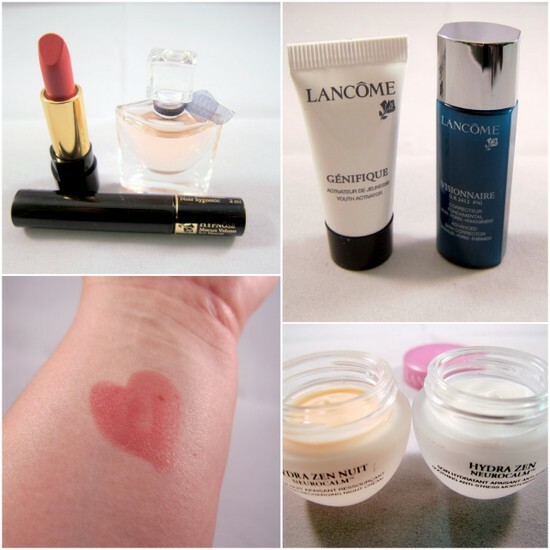 It’s Lancôme Bonus Time! We’ve seen so much loveliness from Lancôme over recent months. Their autumn beauty collection is one of my favourites of the new season – check out the eye palette in my August favourites post. Their recent perfume launch, La Vie Est Belle, was one of the most popular in recent memory and the Rouge In Love lipstick line is entirely fabulous. You’d be forgiven for wanting to try a little bit of everything and hey, look, it’s like Lancôme are reading our minds! Because their latest gift with purchase, exclusively at Brown Thomas, is one of the best I’ve seen in a long, long time. So what’s the deal? Well, from today right up until Sunday, September 23rd, when you purchase two Lancôme products (one to be skincare), you can get your hands on all these brilliant beauty bits in the photo above. Worth a whopping €149, the gift includes a choice of day and night creams (Hydra Zen, pictured, or Absolue Precious Cells, both 15 ml) and a sample of the award winning Visionnaire and Genefique super serums. It also includes a sample of La Vie Este Belle, a mini lipstick and mascara and 125 ml of Galatéis Douceur cleanser (which I don't have). See? Told you it was a good ‘un. Even though this one is exclusive to Brown Thomas, there’s no need to despair if you’re reading from outside Ireland. Check with your local Lancôme counter as chances are, they’ll have something up their sleeves for you guys too. Are you a Lancôme lover? I’d love to know your favourite products from the brand. Lancome always do great bonus gifts & this looks a corker! I'm a complete sucker for these. And this one does look extremely tempting ! My fav is Hypnose mascara!! Me too Steph it's one of my favourite bases! I always like their gift with purchase. That lipstick looks do pretty! Love your review! I am loving their new lip colors and wearing midnight roses tonight to FNO! They make the best bonus gifts. I used to steal my mom's all the time! I... know nothing about any of these products, hehe. I love the color of the product you drew the heart on your arm with!